This is the album I mentioned earlier, put together as a Scrap For Hire Job for my friend and owner of Bags N Blings, a retail and home party company. I decided to make the album from scratch in the form of a purse. 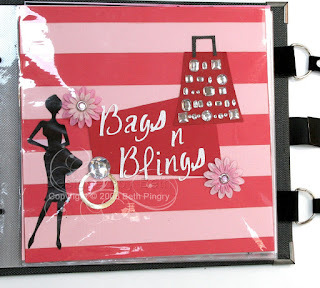 Using chipboard, Fibermark paper, a zipper, ribbon purse handles, album refills, an acrylic page, and my Bind It All, along with some girly rub-ons, pink paper and plenty of bling, I came up with this. I sure hope she likes it! She allowed me to photograph the purses and bling and other goodies, and supplied me with a key photo and some of the advertising and brochures. 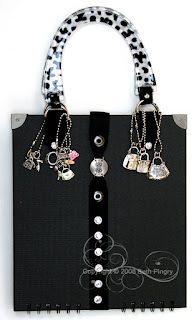 Thanks for looking and don’t forget to come back on Wednesday for my Spellbinder’s Sneak Peek! This entry was posted in Altered Art/Mixed Media and tagged purse. Bookmark the permalink. OMGosh, Beth! This is WONDERFUL!!!!! WOW! I want one! LOL!! Great job as usual! LOVE it, Beth! So cute!